We have been told we are in no danger so I guess will stay put until they say I have to go. At the moment there are six of us here – three paying guests fly out tomorrow on schedule, smoke permitting, and two friends and I will see what happens. We are now the only people in the whole Charlotte Alplands. Today the smoke was not too bad and the guests and I hiked to the top of the ridge closest to the fire. 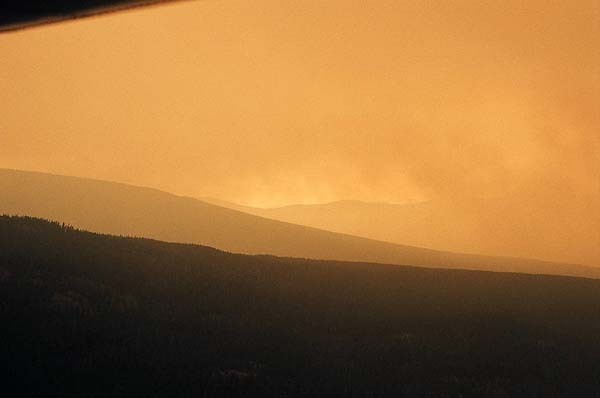 We saw no fire clouds beyond the next ridge – only a pall of smoke – and heard no activity on the Atnarko fire at all, although very distant helicopters indicated that work was going on further north. As we came down, the wind changed and the smoke thickened at once – visibility will have to improve if the clients fly out by plane. My old cabin on the Turner homestead has presumably gone although that is no great loss – it’s destiny was to rot into the forest. John’s loss is of course devastating as that is his life – as this place is mine. Fire insurance is impossible here. I have no capital and could never start again if this went. However I feel safe enough at the moment; my main immediate concern is loss of business . . . A good deluge would work wonders. I can’t see enough of the sky to see what the weather is doing. The visibility has worsened again (as it often does when the sun gets higher because it refracts through the smoke) so the poor clients are stuck here for the time being. They are in good spirits, though and are going to catch some fish. They say they will hold them up in the air on their way back so they will arrive back already smoked! 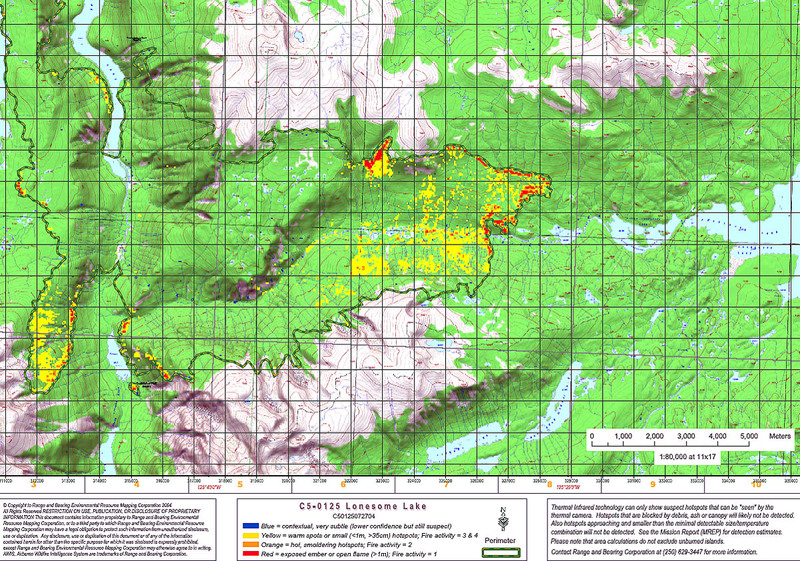 On the July 27 fire map, if you follow the river down from Lonesome Lake (the zig zag lake), just before the fire boundary you will see a faint pale smudge. That was the Turner’s homestead where my Lonesome lake cabin was. John’s homestead was at the bottom right corner of Lonesome Lake. The current clients were delayed getting out on schedule today because the smoke was too bad, but then a fresh west wind cleared most of it away, and looking south and west it is clear and sunny. 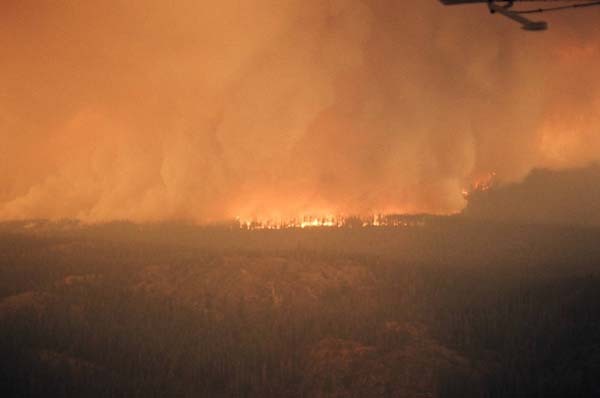 But the wind is stirring up the fires again and an enormous wall of black and orange smoke is rearing over the north ridge and curling overhead, and the fire has now travelled to both sides of Charlotte Lake; I can see the fire towers thousands of feet high above the pall. Yesterday started very smoky (again) and the clients I had who were due to fly out that morning couldn’t go. 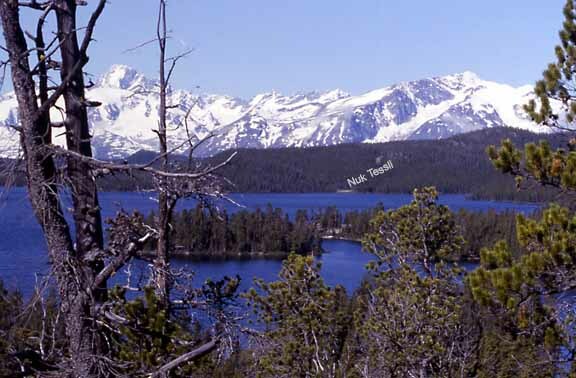 By around two pm a fresh little breeze started from the southwest and we began to make out the land forms beyond the edges of the lake so I called the float plane company and the tourists flew out. That left me and two wwoofers the only people in a huge area – everyone else had been evacuated or burned. All fire pictures © Katherine Stewart. Rapidly, the mountains became clearer and clearer and we revelled in the white snow, blue, sparkling lake, blue sky, things we had not seen much of for quite a while. We enjoyed it for a couple of hours, then suddenly the light went out. Behind us, a huge wall of black smoke had erupted. It had towered above us and the leading edge was beginning to curl over the cabin. The most alarming was the vivid orange colour at the bottom of the smoke wall – in other words the flames must either have been huge or a great deal closer than we had been told. The whole of the north ridge was haloed in orange. The water on the lake in that direction was a dull orange brown, the trees a sickly dull green. White ash started to fall. I called out on the radiophone – Terry at Nimpo was the coordinator for all the radiophone people. He also periodically flew around the fire to check progress. I asked him if he could tell me what was happening but the smoke was too thick from the Nimpo side. It looked so horrifying I decided to bale out. Within half an hour, Stewart’s plane was in. We were standing on the dock, ready, because we had already packed for emergency evacuation (the boxes had been littering the floor for days – some half unpacked as we needed things from them). We had done the dishes and tossed out perishables – should the place be spared I didn’t want bears attracted to it. It was very clear towards Monarch and I expected the plane to come that way but it came right through the smoke. The pilot said the fire was still a good distance away and the wind was blowing it away from me, so I was still very safe, but the flames they passed must have been 300′ high. So we took off and were soon enveloped by the dark smoke above Avalanche Lake. After a while we could dimly see flickers of red. Then suddenly we rounded the end of the ridge: Baby Charlotte (where the Atnarko runs out of Charlotte Lake) was totally ringed by fire and there were several other smaller flare-ups. Black smoke obscured most of Charlotte Lake, but under the heavy black lid we glimpsed the shining Coast Range as at the end of a long, dark tunnel. 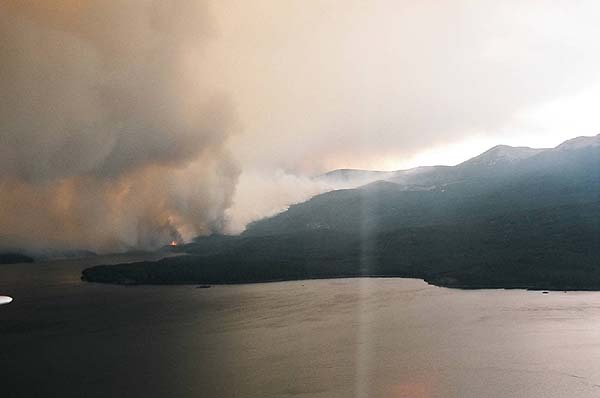 Crazy Bear Lake – in this picture, the fire had not reached the lodge but later surrounded it. However, sprinklers saved the buildings. Looking West down the Atnarko River where the fire travelled 18 kms, burning to the alpine, in two days. Suddenly we were flung into the air like ping pong ball. 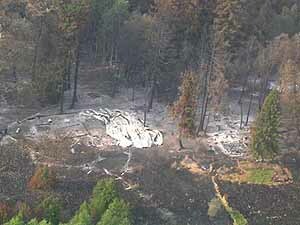 The turbulence was actually fairly minimal up ’til then, but we must have hit the heat coming off the fire. It was over in moments, thank goodness, and soon we were pulling out of the smoke and into a benign and sunny afternoon as we landed on Nimpo Lake. It all seemed so bright and calm and ordinary, as if we were on a different planet. The southwest wind has persisted today, and in fact that is good for me – although pretty serious for the inhabitants of Charlotte Lake. Even Nimpo and Anahim have been put on evacuation alert – this morning the smoke was fogging up the area, but the Precipice is unbelievably clear. 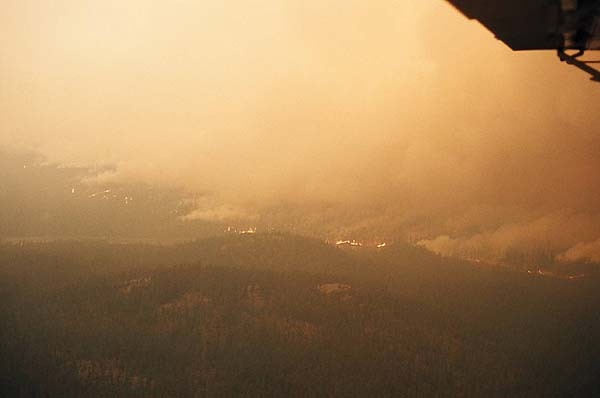 It is now nearly 6.00pm and we will watch the news then go to the rim of the Precipice to look at the fire clouds. Reports I received this morning indicate that although the fire is still pretty fierce in places, Nuk Tessli, unlike most of the other structures in the area, is still very safe. It is protected both by alpine ridges and the wind direction. Between the 28th of July and 30th, the conflagration has not spread a huge amount, and some areas are now under control. When the wind is wrong, the smoke makes it too uncomfortable to be at Nuk Tessli – but a rain could change all that. The fire will have to spread a lot further before any of its destruction will be visible from the hiking area, so I am hoping to be able to continue business as usual as soon as the fire is under control. Yesterday was cloudy and cool with a few dribbles of rain, and we heard that the evacuation order had been lifted for the Charlotte Lake community; an evacuation alert, however, would remain in place – obviously the forestry service wants to protect their rears. 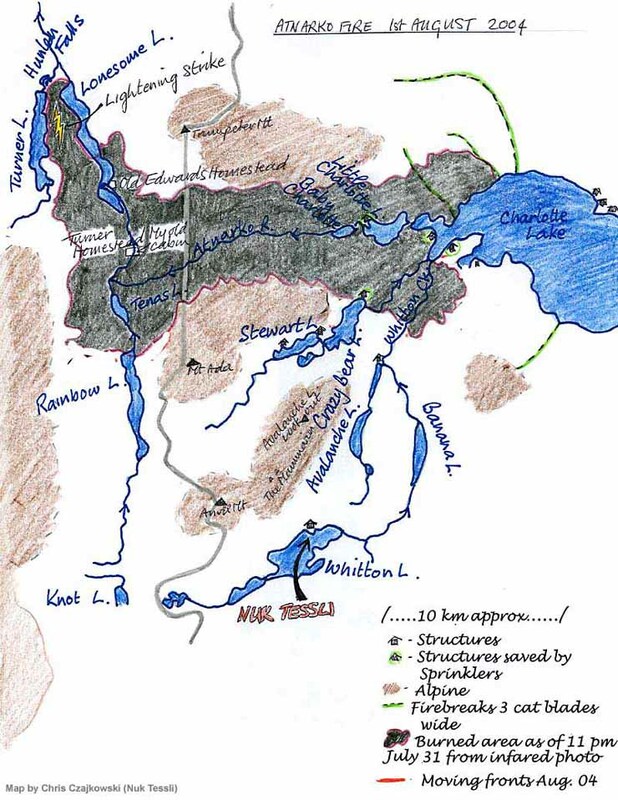 Nuk Tessli is a long way southwest from the Charlotte Lake community, and I could not at first find out if the lifting of the order applied to me. I knew that there was still a bit of fire activity around Crazy Bear Lake over the other side of the North Ridge from my place (about 12 kms and an alpine ridge away), but a crew of 40 firefighters were parked in the lodge’s sprinkler-saved buildings to prevent the fire from spreading to Stewart’s remote cabins on Stewart and Davidson Lakes, and the fire was consequently not going to get anywhere near me. I had been told to liaison with someone at the Anahim Lake RCMP regarding my return home, but although I phoned several times during the morning, the particular constable was not to be found. From several people with whom I was put in touch, I received the standard news readout about the Charlotte Lake community, but no one seemed to have heard of my place. Eventually, around noon, I talked to a corporal who said he would go to the 300-man camp of tents and trailers squeezed between a straggle of private hangars at the Anahim Lake airport (which is normally just a paved strip with a trailer for an office – now 16 helicopters were parked there) and try and find the fire boss. It was lunch time so he might have a problem tracking him down – I was to call the corporal back in about an hour and a half. So that was how I finally received word that I could indeed go home. I arranged with Tweedsmuir Air to fly me in first thing this morning – but (wouldn’t you believe it) rain continued to dribble on and off all night and when the light came into the world, a thick blanket of fog and cloud hid the mountains! Kind of ironic, really. Tweedsmuir Air had a number of other weather-stranded clients whose schedules were tighter than mine, so they were dealt with first, and finally, at around 11.am, me and my two dogs and most of my evacuated possessions climbed into a Cessna 185 and took off for the gloomy-looking wall of cloud to the south. Charlotte Lake (about half way home) was murky from smoke, still, but presented a very different picture than when we had flown over there ten days ago. There were no flames anywhere, but the fire had spread further along the south shore of the lake, and on both south and north shores scattered puffs of bluish smoke spiralled lazily into the air. Large patches of green surrounded the smouldering areas; the cool damp weather and hawk-like vigilance of the fire crews will have no trouble keeping it all well under control. And now we entered the foothills that separate Nuk Tessli from the Chilcotin. At once we caught the stronger south west wind from the coast and began to bump around a little in the turbulence. We immediately left the smoke behind: the cloud began to break up; and there were patches of blue sky, white piled clouds, snow patched mountains, cloud-shadowed forest and the wind-furred grey-blue lake I call my own. The day grew brighter by the second; there was not the slightest trace of smoke anywhere – it was as though the last ten days had been one long dark tunnel of gloom due to the uncertainty of my future; the loss of $8,000 worth of bookings (2/3 of my expected summer income); the added expenses of the unplanned flights out and back home again – and the cost of food at the local stores at convenience store prices, made more frustrating by the knowledge that I had tons of good quality food sitting here at home which I could not access. 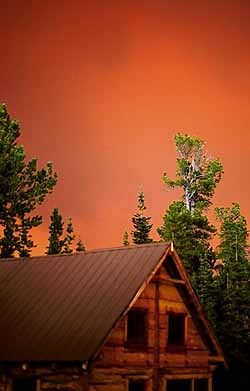 The thought also crossed my mind that, because I had not had time to pack the food up properly, a lot of it was sitting in the main room of the cabin, and if a hungry bear, discombobulated by the smoke, found it’s way up there….. But here I am, everything is safe, even my little garden greens are not too fried through lack of watering, and Nuk Tessli, the West Wind, has blown the world sweet and clean and normal again. Thanks so much all of you who wrote to me concerned about the safety of me and my place. And a special thank you to all those cancelled clients who (to quote one of them) “would not dream of asking for their deposit back” or who are going to re-use it for a future booking. Your support at this time is truly wonderful. Check out Beautiful BC Magazine in November, which will publish a full feature article about me (written at the beginning of August last year), and don’t forget I have a new book coming out in the fall – Lonesome: Memoirs of a Wilderness Dog, in which one of my canines tells the real story of our life together. The accompanying promotional slide show tour will travel from Prince George to the Lower Mainland and Vancouver Island – for details of both the book and the slide show tour, refer to the relevant pages on this site. For more about the fire go to my web site designer’s weblog.